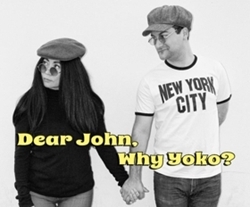 Review: DEAR JOHN, WHY YOKO? Musically Celebrates the Love that Survived Despite ... . Beatles Radio: The Beatles, Solos, Covers, Birthdays, News The Fab 4 and More! Every June, I attend many shows at the Hollywood Fringe Festival, the annual event taking place on Theater Row and in surrounding areas. But so far, none has impressed me as much as "Rock and Roll's Greatest Lovers" which I saw in June 2014. With music by Anzu Lawson and Joerg Stoeffel, book and lyrics by Anzu Lawson, it told the Romeo and Juliet story of John Lennon and Yoko Ono, two rebels from opposite ends of the world who stood together in the name of LOVE, only to face every kind of hate directed at them from fans, the press, and especially the United States government who viewed the outspoken former Beatle as a threat to the re-election of Richard Nixon in 1968.Playwright Anzu Lawson portrayed Yoko Ono with amazing vitality and honesty about who the misunderstood artist really was back in the halcyon days when she met and married John Lennon, after their chance meeting at a small London art gallery where she was invited to display her off-beat art pieces. Lawson dedicated the play to Yoko Ono for her strength of spirit to carry the message of love to us, still to this day, and for anyone who has ever been misunderstood for speaking their own truth authentically.